What is a Louisiana Non-Disclosure Agreement? Louisiana Non-Disclosure Agreement: What Is It? 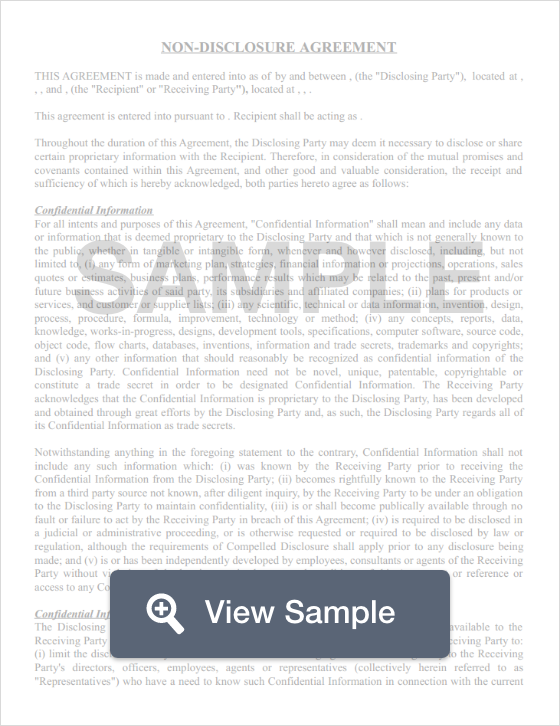 A Louisiana non-disclosure agreement is more commonly known as a confidentiality agreement. While Louisiana non-disclosure agreements are used to protect trade secrets and confidential information, it's important to note that Louisiana law states if it is information that an employee or contractor can recall the information from memory, it will not be covered under a non-disclosure agreement. Non-disclosure agreements are governed by Louisiana’s Uniform Trade Secrets Act, LA Rev Stat § 51:1431. According to Louisiana’s Uniform Trade Secrets Act, something is considered a “trade secret” (which means it may be eligible for protection with an NDA) if it is information such as a formula, pattern, compilation, program, device, method, technique, or process that has its own potential or actual monetary value. It may not be information that is generally available to the public or something that’s easy for another business to figure out. A business must also take reasonable steps to make sure that the information being held out as a trade secret is actually kept secret. Recent rulings have held that information that an employee or contractor can recall from memory is not considered to be a trade secret or confidential information for a business. Because of this, it is imperative that a business do everything it can to protect their processes and procedures. In addition to using an NDA, a business should use a Louisiana non-compete agreement to provide an extra level of protection.